I’ve been refinishing furniture for over 11 years now, and I have heard every excuse in the book of why not to paint furniture. I’ve compiled a list of the most common hesitations people have regarding painting their furniture, and I’ve given you my answers!! Paint it? It’s real wood! My answer to this one is that it will still be real wood once it’s painted. It’s just painted real wood. Painting your furniture does not, in any way, diminish the quality of your piece. In fact, painting is an easy, inexpensive way to bring your piece back to life, compared to sanding it down and re-staining. Our chalk finish paint (a furniture paint) does not penetrate the wood. 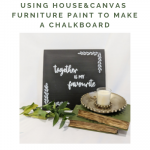 It forms a layer on top, so if you decide in the future to bite the bullet and re-stain your furniture, you can easily sand away the paint. Paint it? It’s not real wood! 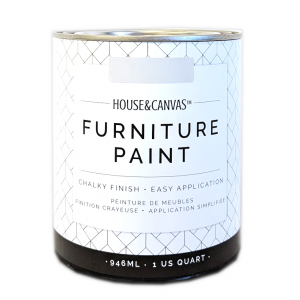 The beauty of chalk finish paint is that it can be used on a multitude of surfaces, including (often affordable) furniture!! 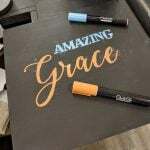 You can paint veneer, laminate, pressed wood…. you name it. 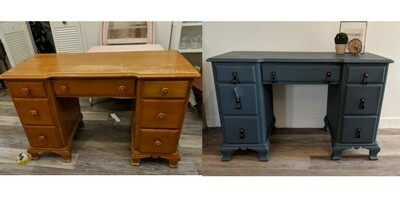 If your inexpensive furniture still has some life to it, just paint it!!! 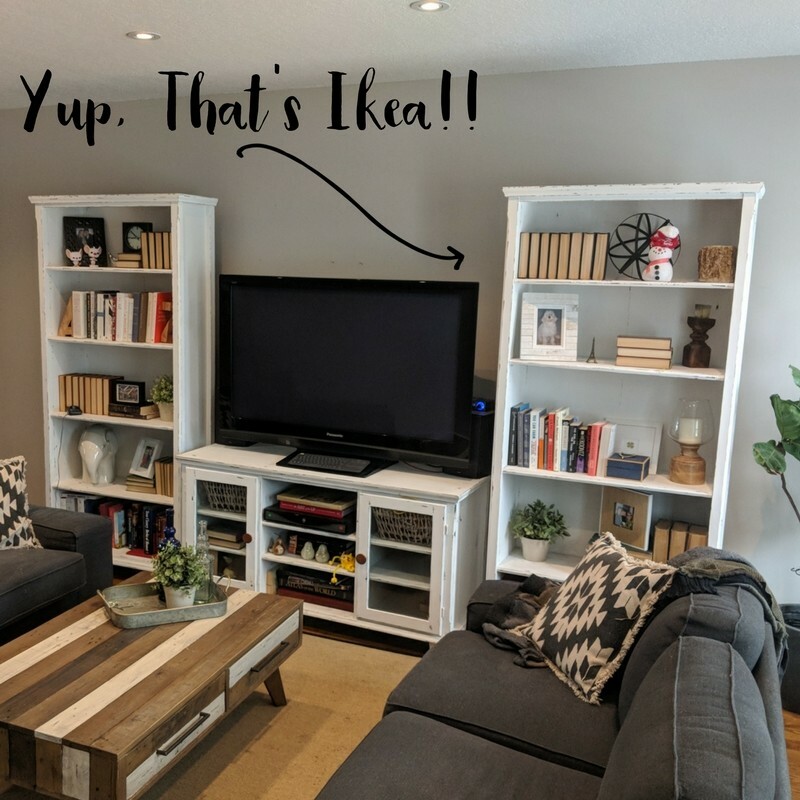 I bought my Ikea Hemnes bookcases and TV stand over 10 years ago. I painted it white about 5 years ago and it still looks amazing! Paint It? It’s my grandmothers cherished heirloom piece! I hear this all of the time!! “My grandmother would be rolling in her grave if she knew I painted this!”. I get it, It’s hard to imagine painting a treasured piece that has been passed down through generations. In response to this, I always ask “where is the piece now?”. Most of the time, the furniture piece is in the basement, tucked in a corner, or hiding in a room that doesn’t get much traffic, simply because the piece is ugly and dated. I’m pretty sure that the fact you aren’t enjoying the piece is what’s going to upset Grandma. She didn’t pass on her furniture piece to be a burden on you, she wants you to enjoy it. Paint it. Update it. Bring it back to life so you can finally enjoy the piece. 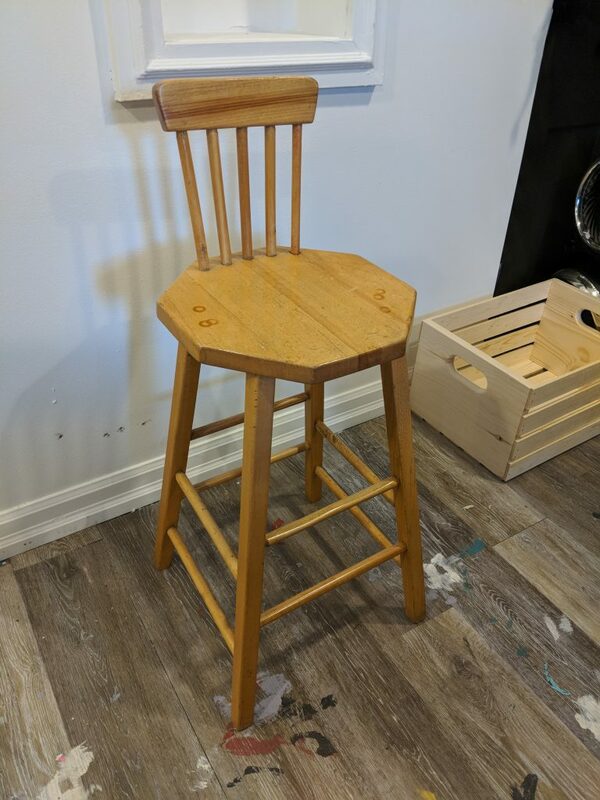 I recently refinished a stool that a customer used at the dinner table as a child. It was worn and tethered and needed TLC. I gave it a few coats of navy, and now the piece proudly sits in her kitchen for when her Grandkids come to visit. Paint it? It’s an antique and worth a fortune! 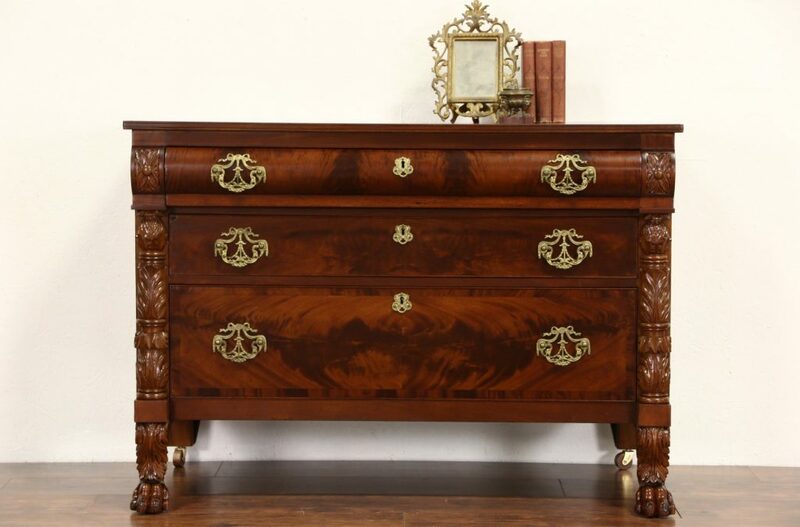 If your piece truly is an antique and you think it’s worth a fortune, my advice is to make sure it’s actually worth what you think!!! Often, people hang on to furniture thinking it has a high value, when in fact, it doesn’t. Nothing worse than hanging onto a piece for years and years thinkining it’s worth something, only to find out it’s not. And all those years, you could have updated it with a coat of paint and actually enjoyed it. Paint it? It too much work and I dont have the space! 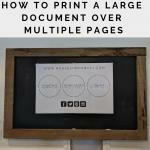 It is sooooooo much easier than you think!!! You generally only need 2 coats of paint, and the paint dries in less than 60 minutes. You can easily paint a piece in a day. No sanding means no mess. No priming means no smell. 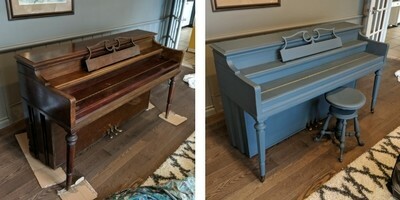 If I can paint a piano by only moving it a couple of feet from the wall, you can paint anything, any where!